HELP Foundation helps people live their best lives HELP Foundation helps people live their best lives - HGR Inc. This is exactly what I was hoping to hear from David, and he wasn’t just saying that to please me. He’d had a long day working at HELP U Shred and was looking forward to getting home. While not an uncommon experience for most people, this was a great step for David and an indicator of the value and success of the HELP U Shred vocational program. David has lived his life coping with a developmental disability, but that doesn’t mean he is unaware of the world he lives in, or the implications of his disability. In fact David, and most of his peers, know that they’re disabled, know what that means for their lives, and face the world each morning with their own hopes and dreams. Assisting people like David to live their best life is at the heart of HELP Foundation’s mission of service. Employment is one of the biggest challenges facing people who have a developmental disability. Job training, personal skill development, and bolstering the self-confidence of the individual are keys to employment and are the focus of HELP U Shred. 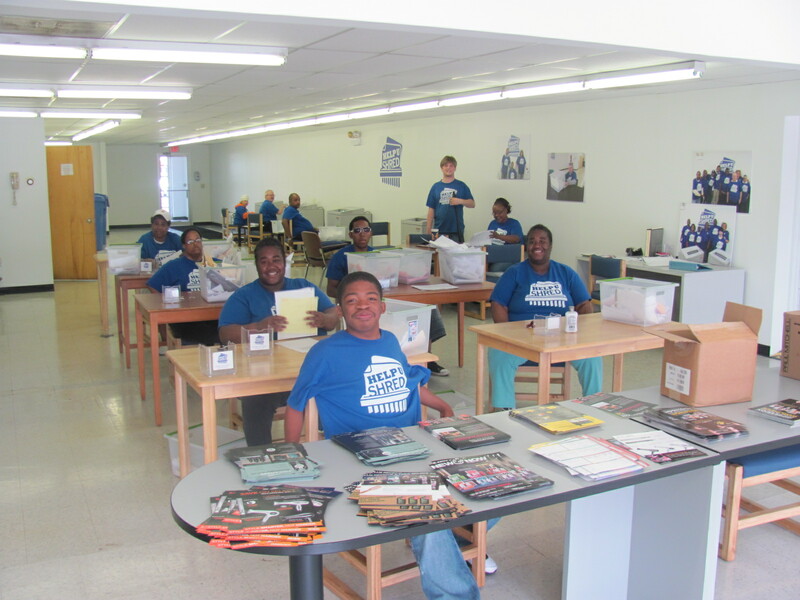 Our vocational training program is a successful business that provides secure document destruction and recycling services to government and commercial customers. Servicing our many contracts means that all 54 HELP U Shred training employees are faced with real-world workplace demands and expectations. They work hard and know that they are valued members of the team. What they also know is that, unlike many other job training programs, they aren’t being paid a sub-minimum or piece-work wage. HELP U Shred pays the full state minimum wage to trainees. That doesn’t sound like a big deal, but it is remarkably rare, and it makes a big difference in the lives of folks like David. HELP U Shred is only one part of HELP Foundation’s array of services that reach more than 700 people each year through housing, adult day support, and specialized programs for seniors and children. Serving Northeast Ohio since 1965, HELP celebrated its 50th anniversary in 2015 with the opening of the HELP Administration & Training Campus on Euclid Avenue. For more information about HELP, such as our May 22 Run for Awareness 5k in Euclid, please visit www.helpfoundationinc.org.